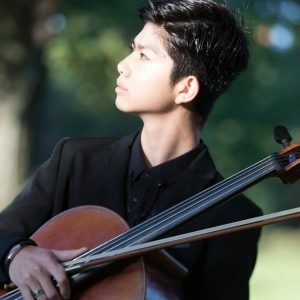 Sai Sai Ding is already quite an accomplished cellist, having won several local and international competitions before completing his first year in high school. Sai Sai and pianist Yurie Iwasaki perform at the 10th Annual Charles Barr Memorial Concert on Saturday, May 14, at the Dallas Museum of Art’s Horchow Auditorium. Doors open at 2:30 for the 3:00 concert. As always, the concert is free. The program includes works by Locatelli, Crumb, and Brahms, and also features an update on some of the Barr Memorial Concert alumni. What is your favorite piece on the May 14 program, and why? I like the Brahms sonata the best because the transitions between movements are written in such a special way that it feels like the audience is being lifted half an inch from the seats. What do you love about chamber music? How is it different from playing as part of an orchestra? I love to play chamber music because you get to play it with friends as a group. It is different from playing in an orchestra because you get to express the music more passionately as an individual than playing as a section member in an orchestra. How old were you when you started playing cello? Why did you choose that instrument? I started playing cello when I was 6. I choose to play the cello because I love how the cello sounds, plus my mother encouraged me to play it. How many hours a day do you practice? I usually practice four hours a day. How do you spend your time when you’re not doing schoolwork or playing cello? I love to play basketball! When I’m not busy with cello or schoolwork, I like to play basketball or hang out and have a movie night. What types of music do you listen to? Who are some of your favorite recording artists? I listen to hip-hop, classical, and rap. My favorite artist is Yo-Yo Ma. Who’s your favorite composer? My favorite composer is Dvorak. I just love his Cello Concerto in B Minor – it is one of THE best cello concertos ever written. What’s your dream piece to play? What do you like about that piece? My dream piece to play is the Schumann concerto [Cello Concerto in A Minor]. I like it because the music is so touchable, and it requires a high level of musical understanding. If you could see any concert by any artist living or dead, what would it be? I would go to every single concert by Rostropovich, especially to watch his Dvorak cello concerto performance.